While in Wagga Wagga for my mother's funeral, I called into an op shop with my uncle, who was looking for reading matter to sustain him on his somewhat erratic homeward journey (he's returning to Brisbane via Melbourne and Sydney). 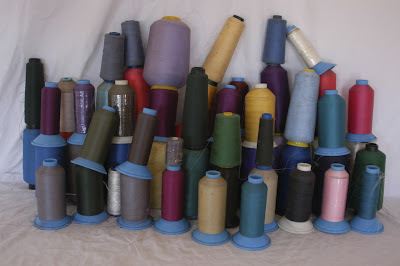 I found these threads on a table out the front of the op shop. Some of them are very grubby and I don't know how useful they'll be but I couldn't resist buying all of them. I must go and start playing. Hi Monica, I found your blog using Google. Try G when you try to find mine. I am so sorry to read that your mom had passed away. I know how hard that loss can be. My dad died a year ago in November and there isn't a day I don't think of him. Congrats on all those threads. I got a bunch of large cones from a dress manufacturer a while back and there are some colours I will never need to buy. They aork great in the bobbin when using specialty threads, like rayon. I use a topstitch needle for most of my work and I have great success with most of those specialty threads. Congratualtions on your grand daughter. My first great neice was born last week, Madelyn Sarah in Newfoundland which is a long ways away. Enjoy your Treasure Trove! Maggi, I agree with the appropriateness of finding the threads at that time. Also the fact that they were in an op shop. My mother loved op shops and bought a lot of her clothes there.